The parentage of the Verde macaw lends itself not only to gorgeous coloring, but to a very good tempered and intelligent pet bird! The Verde Macaw is a first generation hybrid macaw, meaning its parents are two species of naturally occurring macaws. "Autumn" is a hybrid macaw cross between a Scarlet Macaw and a Buffon's Macaw. The Scarlet Macaw is very beautiful, inquisitive, and intelligent, but a bit more boisterous than other macaws so requires good socialization. The Buffon's Macaw is quite docile and affectionate. This mixture makes for a very intelligent and trainable pet, that can also be an affectionate companion. But it will also need a firm consistent hand in training, especially as it matures. Hybrid macaws are bred primarily for color. Because hybrid macaws are a mixture of more than one type of macaw, the offspring are influenced by the traits and characteristics of both of its parents. Father's have the dominant gene, so this will generally influence the offspring's coloration and overall appearance. However the behavior and temperament are more unpredictable. Besides being a hybrid that is very attractive, the personality influences of the Verde Macaw are a good mix for an active, lively pet bird. With the intelligence and temperament of both its parents it should also be quite trainable, learn to talk and do tricks, and have an amiable nature. 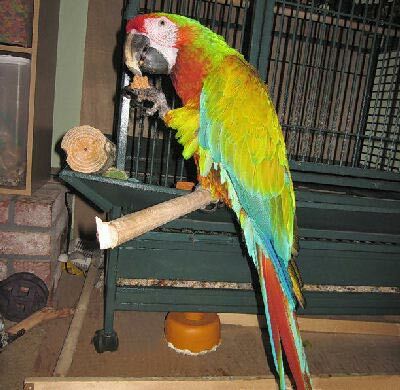 As with all macaws, they will require good socialization and consistent training to make good pets. Scientific name: The Verde Macaw is a first generation hybrid macaw. It is a cross between a Buffon's Macaw Ara ambigua and a Scarlet Macaw Ara macao. Description: The Verde Macaw, being a cross between a Buffon's Macaw and a Scarlet Macaw, is a very colorful hybrid. Though the father's have the dominant gene, which will influence their final appearance, both parents contributing to the striking colors of their offspring. Verde's are a full size Macaw and can learn tricks as well as mimic a few sounds of the human voice. Size - Weight: A full sized macaw, they can get over 2 lbs. Lengths generally up to 85 cm (33 inches). Availability: Finding these macaws for sale is generally hard as they are rare, and they are expensive. There are more and more macaw breeders however, so finding these macaws for sale becomes easier as they become more common.